It’s been one since I got married and everything so far has been no less than awesome. I’m happily married to a man I respect and admire but still love and cherish with equal depth. We’re planning to get our house by the end of the year – BTO Bukit Panjang Segar Palmview. Anyway, this isn’t a life after wedding blog so I shall get to the good news. My BFF / Maid of honour at my wedding is a newly engaged girl and I’m helping her plan the wedding! So good news, she’s allowed me to blog about it and hopefully hope you guys planning your wedding. The rest is completely up in the air and undecided and unbooked. I’m helping the couple cause they are currently residing in Melbourne taking care of their yoghurt business. But she’s flying down from 2- 18 June to dedicate 1 whole week to see to wedding matters. She hasn’t decided on a photographer and videographer yet which kinda scares me. You know how the best are booked up wayyyy in advance. Will update the progress within the week, in th meantime if you have any request of specific pictures from any of the bridal houses or venues let me know! Ok so maybe no one comes around here anymore but I’ve been missing some creative action and I decided to start documenting (again..) the process of my new house! Kinda like a graduation of sorts, wedding then house, who knows sooner or later I’ll start a mommy blog. THAT is another story for another time.. For now, I’m starting on my 1 year journey to interior design heaven. (Or hell depending on my fickle brain.) I’ll be holding on to the same principles I designed my wedding with – Cheap/Good/DIY/Meaningful so if you are a Singapore new wife waiting patiently for your BTO (Built to Order) Flat to get ready, you could tag along and share your ideas or home decor with me too! I just got my wedding video!!! Firstly, just to establish the time line better, I contacted Celestine from Fotowerke 1 month before the actual day, asking if he was available. Usually videographers are booked at least 6 months to a year in advance so our wedding was pretty last minute – a little treat to ourselves because we had saved so much anyway. I had found them on SingaporeBrides.com and they came with so many good reviews and recommendations. Celestine was quick to reply to my enquiry and was quick to reply all my subsequent replies. All in all it took a week of to and fro before we went to view some samples at his house which we loved. He was very warm and informative. On the day of the wedding Celestine’s colleague (Wei Sing?) was the one to film the whole day. He was pretty quiet and shy, which is good in a way because they style was less directive and more candid. They didn’t tell us to do poses or intrude into private moments. I had hoped for more colour correction especially in some lightings – things either turned out slight yellow or orange.. but if you are not that picky on the colour correction then the video was simple and really sweet. I don’t really like too stylized or too cheesy stuff.. They really hit a good spot. Simple but not boring. They were so friendly on my pocket!! And I absolutely love them for this. To be honest, I might have this DVD on replay for the next few weeks, but after that, I may play it for special occasions only. Not worth spending $3000 on. Fotowerke quoted me $1,200 for 1 whole day + 2 sets of DVD of the whole day. About 2 hours of show time. I did not want a highlight video for dinner cause my photographer’s package already included a slideshow highlight. I don’t know if they still quote this price – but if they do, rest assured its a good deal. The waiting time was 6 weeks. My DVDs were hand delivered to my office in a hard-cover embossed box that read Fotowerke. The CDs had a very nice rose print with our names and date printed on the front of the CD which noted if it was the wedding day or banquet. Really high quality stuff. I wonder if anyone still comes here… Hello, anyone there? Heh. Well, it’s true, the wedding is over. I don’t have much to update unless I have another wedding coming up (which I hope never happens, and if it does, it’s not mine!) so this space has been left to rot in the emptiness of the ever-expanding world wide web. Most reviews are done, unless you brides were looking into getting something more detailed about other things I didn’t review about, let me know. Contract does state the completion to be 4 to 6 weeks from the wedding day. We are currently in the 4th week so it shouldn’t take too long more, right??? I’ll write their reviews when they come in. Before this review, I just wanna state a disclaimer that M is a member of RSYC and has been for almost 10 years. Our easy wedding may have been a result of M knowing a few people thus making the flow a lot easier. There’s very little to complain about. I didn’t interact much with the staff on that night. However correspondence with the F&B executive Bella was smooth throughout the months leading up to the wedding. No one really complained about bad service so I’m presuming everything went well. Our banquet manager knows M very well because M’s been a member for quite a while, he was very nice and made sure we always had food in our buffet trays and that the drinks were always topped up. Some of my friends got lost. haha It’s true it’s not exactly the easier place to find cause it’s very ‘in’. That being said, I love that it’s not crowded. I loved my wedding. Regardless of could have possibly happened, I enjoyed it all. The location was great but the experience of having this huge party with all your loved ones was even better. They responded to my emails promptly and was very clear with the service they were providing. They also bared with my fickle designs on the picture border. Which I went back and forth with them till I thought it was perfect. On the day itself, they were very friendly with my guests and even in the hot outdoor weather, they took well to the stuffy area they had. They brought SO MANY props! I many there were close to a hundred props – costumes hats, swords, banners, cards that said the funniest lines! I’m giving them a 5/5 because they were honestly one of the best decisions I made to have for the wedding. Everyone absolutely enjoyed themselves and was really excited about the photobooth. Some were really hogging it! haha. Everyone had so much fun and my only regret was that I only hired them for 2 hours, but in retrospect I think 2 hours was enough.. if not no one would have sat down and listened to our speeches! I got them through a Groupon Promotion at $288 for 2 hours, Unlimited print outs, Unlimited props.. Go Groupon! And even though i used a coupon, Phooth did not treat me any differently. It was really cheap in my opinion and so well worth the price. 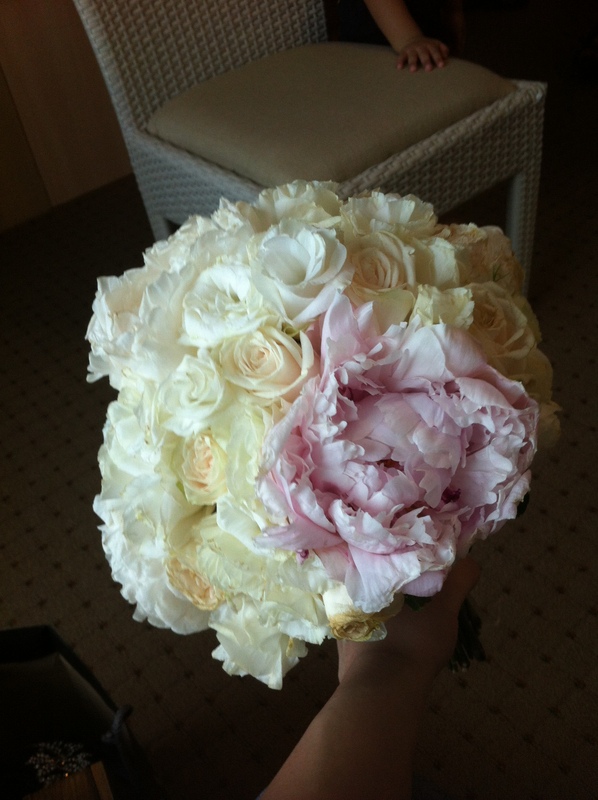 When I saw my bouquet the first time I remember gasping. It was perfect. Big and lushcious and white and glamourous. The flowers arrived in a bag of water that I kept attached to the bouquet until 1 hour before my church walk-in. I spray the flowers with flower hourly from Friday night to SAturday ensuring it didn’t dry out. Corsages were also given as requested – pink and white eustomas, not too big. I would have like M’s white rose corsage to be bigger but I suppose she didn’t have that flower on hand. 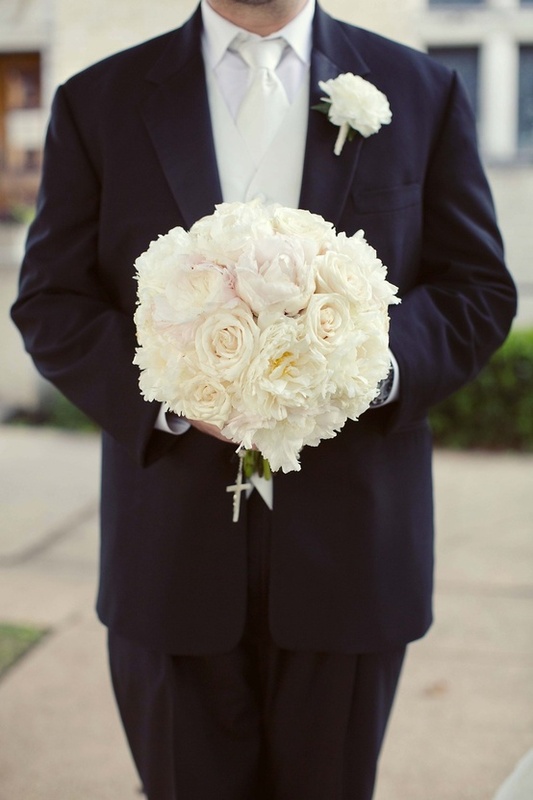 Below is my inspiration picture vs my actual bouquet… Pretty close right! I might be bias but I like my bouquet better. haha. I met Jennifer last December and discussed this plan with her. She was quick to tell me what was available in my price range and suggestions. That was the last time I saw and spoke to her too because there was no necessary contact till Friday where M collected the bouquet for me. Although it was included in my silhouette package, I had to pay them first then the price will be deducted from my 2nd payment to Silhouette. Strange arrangement if you ask me, but no problem to me. I paid $180 for bouquet / 6 corsages / hair flowers. Bouquet had 6 peonies. I did my research, price is definitely below average. Good! No major complains at all. Easy and trustworthy seller. Maybe her location was a little inconvinient in Depot heights (Henderson area) but other than that, pretty good. To be very very honest, I don’t know. Haha. 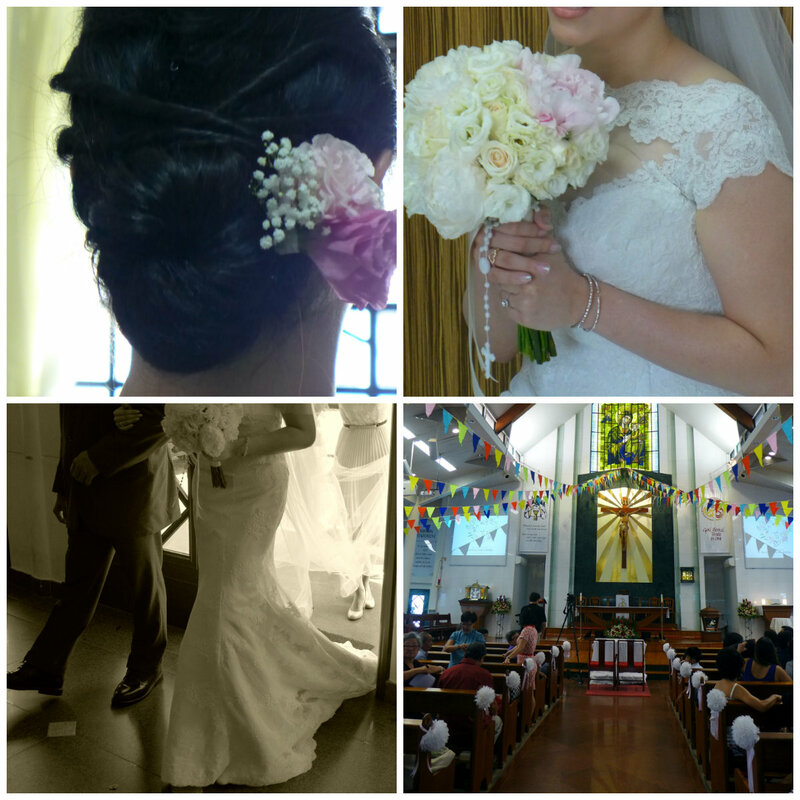 I was too busy being a happy bride and saying hello to everyone who came to my church wedding. However, I did get feedback from everyone who said that the food was really good. Especially the dry Mee Siam which was apparently really delicious. I remember eating a bit after my maid of honour shoved some food in my face and made sure I ate some food lest I fainted or got gastric or something. They were the only caterer out there who really fit my merger budget of $7 per person with 7 dishes and 1 drink. And yet, for the quality that came along with the price, I think it was very well worth it! Cheap and good. I was really impressed that the whole buffet cost me less that 1.5K. They were nice and responded to my emails promptly, often only letting me wait for one day at maximum. They also called me on Friday to reconfirm the order and thank God they did! They almost missed out my dry Mee Siam order… but they pulled through in the end. We only had 2 choices – Purple or Brown. I choose purple because that was the closest I could get to Pink. I don’t think there was a way to choose another colour, I didn’t ask. I was fine with purple. Not much extra decor, everything else was done by us. 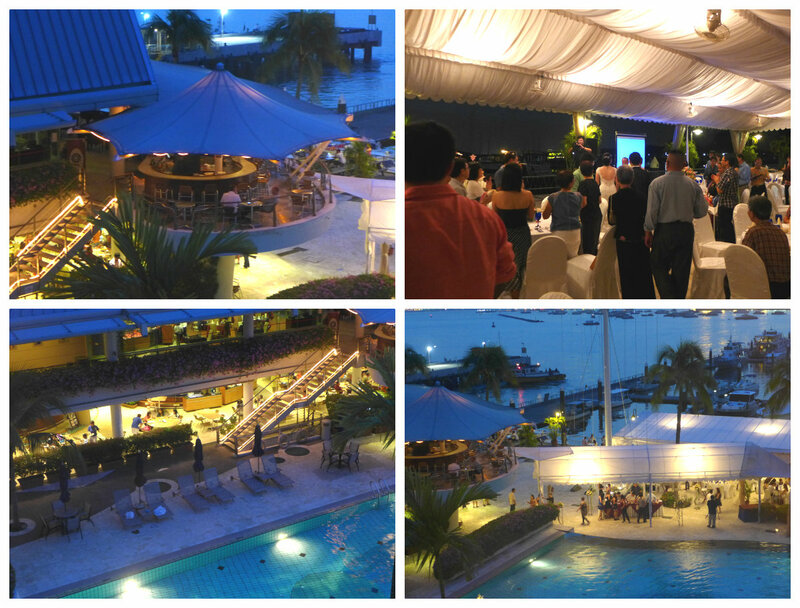 Another point to note is that they came down to my venue 1 day in advance (fRiday night) to set up the tables. Good initiative I thought. No regrets at all choosing them! Good food at such an awesome awesome price.